Reading American Splendor is always a refreshing visit back home for me, a native-Clevelander and now a resident San Diegan. The blue collar ideals. The working man’s mentality. The dreary outlook. I think when you grow up in that town you make no apologies for being a realist, a pessimist, or a skeptic. It’s the lack of sunshine that Clevelanders see on a day-to-day basis that makes you all piss and vinegar. With all of the sun I get now, I’m just not used to it, I’m homesick at times, and American Splendor grays up my day up just fine. From the black and white (and inkwashed) art, to Pekar’s groucho demeanor, there’s enough in here to get you down and kicking the dirt. It’s warranted given our world and live in general and this issue how well-versed and well-read Pekar is. From politics, global warming [Josh], the history of Russian and Jewish immigrants in Cleveland to avant-garde jazz [Dean], there’s a lot on his mind. The hours spent in Zubal’s bookstore tailor a well-read man. Whether you’re from Cleveland or not, you personally care about these observations or not, you’re still drawn to what HE thinks about them. Why? He captures everything that’s beautiful and equally ugly about living today in a few panels with his honest and blunt words–and that’s as American as you can get. 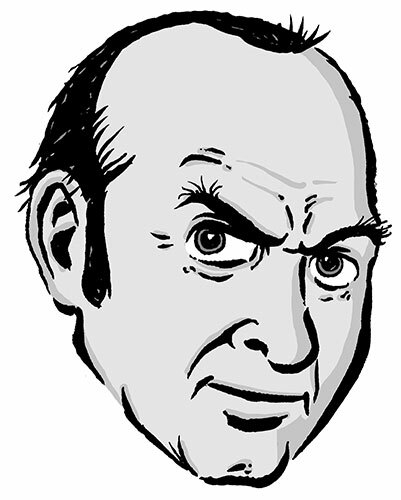 This week I’m working on a Harvey Pekar story for the next American Splendor mini-series from Vertigo. It’s a cute piece, and is the sequel to the one I did with him in last year’s Another Day TPB. And I actually appear in the story as a character, which is humorous (and fun to draw). This story (like many of Harvey’s pieces nowadays) is mostly set in and around his house, and one challenge I’ve come across is drawing Harvey’s abode. Even though I’ve been working with Harvey for almost fifteen years (! ), and I’ve met him plenty of times in person, and hung out with him at conventions, book releases, and movie premieres, I’ve never been to his house. So whenever I draw it, I basically just make it up. Way back, when I did my very first Splendor story, I got Harvey to send me reference photos of one of the other characters in the piece. But as the years went by, I just began winging it, or swiping characters and interiors from previous issues of American Splendor. The only “reference” I use now are some shots of Harvey I cobbled together from the Internet, the work of other artists, or — horrors! — popping in the DVD of the film and using that. And even though I’ve drawn many stories set in his house, I tend to be dissatisfied with what I’ve done before and usually do something different each time. In essence, every time I draw a new A.S. story, Harvey’s pad undergoes an extreme makeover (sans Ty Pennington)! The only consistencies are the books, magazines, and newspapers piled everywhere, and the general air of post-bohemian shabbiness. So this got me thinking what a great idea it would be for someone to create an American Splendor “bible sheet” — basically a packet of reference photos for artists to use. You know, like what DC might provide if you were drawing a Batman story and needed to get the details of Wayne Mansion and the Batcave just right. All a Splendor bible would need are some up-to-date shots of Harvey, his wife Joyce Brabner, their foster daughter Danielle Batone, and some interior and exterior shots of his house. Their car, would be nice too, as it seems like the make and model change with each artist who tackles it. Now that Vertigo is publishing A.S., this seems like something I could bring up with the editors. ‘Course, what makes drawing American Splendor so much fun, and so liberating for me, is the freedom I’m given to add my own perspective, my interpretation of the “facts” of the story. But I think a little more foundation for my improv would only help in the end. The flurry of the holidays (and the desertion of my intern) prevented me from getting much done on the A.D. front in December, but I did manage to complete Chapter 8, which now weighs in at a whopping 20 pp. So if you haven’t yet caught up with A.D. or the two-part “The Bowl Effect” storyline, please check it out now. And here’s an added incentive: A.D. was nominated as a top comic of the year by both USA Today‘s “Pop Candy” and ComixTalk! 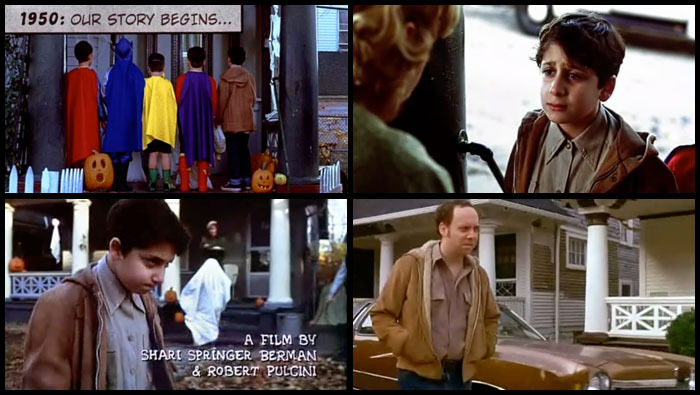 and I will be representing American Splendor at the Broadway branch of the QPL this Thursday. Host Michael Sherer will quiz us about working with writer Harvey Pekar on the series, and we’ll discuss the process of illustrating comics from script to finished product. The discussion will be accompanied by slides of comic art in various stages of completion, and a Q & A session will follow. Should be fun! 40-20 Broadway, Long Island City, NY. As Harvey Pekar’s unofficial, unauthorized archivist, and in honor of the publication of The Quitter, I’ve updated my list of Pekar’s artists! From R. Crumb to Joe Sacco, “Dino” man_size Haspiel to Gary Dumm, Joe Zabel to Frank Stack, Chester Brown to Jim Woodring — even Joyce Brabner to Alan Moore — this is where you can find which artist drew what story. The list is organized by artist’s last name and features the title of the piece, where it appeared, and the date it was published. It’s fairly comphrehensive: I own pretty much everything Harvey’s ever published, with the exception of American Splendor #1 (but a lot of the material from that issue ended up in the first AS collection), but if you spot an error or have an addition, please let me know.